However, a couple of months later & here I am again writing another review for it, this time addressing the question is AWOL Academy a scam? Because since initially joining my views on the company have changed quite a bit. The main reason for that is because I since came across a program named Wealthy Affiliate which basically covers all the same training that’s found inside of AWOL Academy but at a fraction of the price. And when I say fraction I really mean it because the WA program actually costs less than 1% of the price of AWOL so yeah a pretty big difference to say the least. In fact you can actually get started with the Wealthy Affiliate program for free, but hey ho all I’m trying to stress is the fact that the WA program costs nowhere near as much as the AWOL Academy program, yet in my opinion I feel like it delivers more… Which basically is why I’ve decided to re-look at the AWOL program & share my new thoughts here in this new review. And if you are at all considering joining AWOL Academy then you should definitely stick around & read this review right to the very end because unlike the other reviewers that have apparently “reviewed” it, I’ve actually tried the program first hand myself… Meaning ultimately what you are getting here is a review from an actual member who can give you real insight into how it actually works rather than a review written by somebody who is just going off hearsay. First things first, you might not actually have any idea as to what AWOL Academy actually is so let me start out this review by touching on that. Essentially AWOL Academy is an affiliate marketing training program. This basically means that after becoming a member of AWOL Academy you will be provided with a whole bunch of step-by-step training that will essentially walk you through the process of making money by promoting other people’s products online. So for example you could sign up as an Amazon affiliate which would give you the ability to earn commissions by promoting any of the products found on the Amazon website. You basically get a unique link which tracks all the sales back to you, so if you promote this link, somebody clicks it & then buys something they’ll be tracked to you & Amazon will pay you a commission in return. And it’s not only Amazon that offers an affiliate program, in fact there’s probably an affiliate program out there somewhere for pretty much every type you can product you can possibly think of. The good news about affiliate marketing is that it is actually very easy (providing you’re willing to follow training & work at it) and there’s also the potential to earn a very large income. The income you can make is completely uncapped so the more promoting you can do the more money you will be able to make. It takes a little while of tweaking to get to this stage but once you “crack it” you’ll pretty much be able to generate money on demand… I’ve seen some affiliate marketers earning in excess of $100,000 per month (yes for real) and I myself have been able to generate an income of over $10,000 per month online through this method. So I just want to start out by saying that the method of making money itself that you’re taught through AWOL Academy (which is affiliate marketing) is definitely solid & you can definitely make money with it, there’s no denying that. There are a couple of things that are a bit disappointing about AWOL Academy – well, disappointing at least when you compare it to other programs like Wealthy Affiliate. The first thing is that when you buy into AWOL Academy for the initial price of $99 you’re not actually getting access to the full thing. As I previously outlined in this earlier AWOL Academy review that literally only gets you access to the starter product which they call AWOL Pro Academy. From there once you’ve completed that training you’ll be required to keep buying more & more products if you wish to continue with the program. In total these products could set you back around $10,000 which is quite a lot of money I think you’ll agree! Now I want to make it clear here that I’m not taking anything away from AWOL’s products – they are actually very good products & the training that Keala Kanae (the creator) has laid out is very easy to follow. You’re presented with step-by-step videos & it’s basically a case of Keala explains, then you copy what he does in the video to essentially “duplicate” his method of making money. Because AWOL Academy is heavily geared towards using paid advertising… So basically the whole step-by-step process teaches you how to build an affiliate marketing sales funnel & then goes on to show you how to place ads on Facebook to begin making money. Can you make money with this method? The answer is yes, the sales funnel Keala teaches you is a solid sales funnel & many people run very profitable Facebook campaigns… BUT… and this is a big but, there is no “proven” formula to Facebook advertising. It takes a LOT of trial, error & tweaking. This isn’t usually too bad when you’re working with free traffic, but when you’re working with paid traffic this can quickly see you spending hundreds & likely if your budget allows, even thousands of dollars before you manage to even break your first profitable campaign. The advantage of paid traffic is that if you do manage to crack it (which as I’ve mentioned is initially very costly) then you can quite easily go on to quickly scale the campaigns up to make a lot of money in a short period of time. However if you don’t manage to crack it then you could see yourself burning through all of your funds before you even manage to turn a profit. Essentially it’s a bit of a gamble (albeit one you’re slightly in control of), but in my opinion I feel that it’s too much of a gamble for a starting point. With starting point being the key word in that sentence. You see I have nothing against paid traffic overall, but starting out with paid traffic in my opinion is just not the right way to go. That’s one of the reasons I decided to favor Wealthy Affiliate over AWOL Academy, because Wealthy Affiliate starts out by teaching you the free methods so you can play about without spending any money, THEN when you’ve figured out a profitable campaign it teaches you how you can scale it up with paid traffic. The other reason was of course as I mentioned above the fact that WA is a heck of a lot cheaper – and I’m really not kidding about that. Wealthy Affiliate offers 2 levels of membership, free (Starter) and Premium. Free is obviously free & the Premium membership costs $47 per month, that gives you access to literally everything the program has to offer. Compare this to the $10,000 full-access fee of AWOL Academy & you can see that WA actually costs less than 1% of AWOL. Honestly, no AWOL Academy is not a scam. I know there are some reviews online calling it a scam but in my opinion I think they’re wrong to do so. 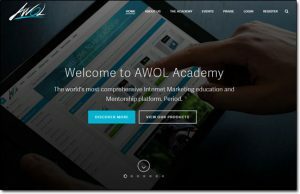 I signed up to AWOL Academy & I enjoyed the training, I just decided not to continue when I see all the additional upsells that were involved inside. So the answer to that question is no it’s a scam, but it’s an expensive program. The training is expensive & the method that they teach you (paid advertising) will require that you have a fairly large budget to get started. Some people online are calling it a scam purely based on the fact of how expensive it is, but in my opinion that’s no reason to call it a scam. Keala created the training & realistically he can charge whatever he wants for it. It’s not like he is misselling anybody into it or telling them that if they hand over the cash they’ll instantly begin making money… Instead he does the opposite, AWOL Academy (despite the flashy mansions/cars) has one of the most honest sales pitches I’ve come across. It’s a legitimate program & if you follow it to the letter you’ll likely begin making money (providing you put in the work required). I just decided not to personally continue with it because I came across Wealthy Affiliate… and I know it seems like I’m totally plugging that throughout this review but to be honest that’s because I am. I just feel that before you splash $10,000 or more on something you should probably know that there are much cheaper alternatives available. Alternatives which in my opinion actually give you more value for money. There is no denying that WA certainly contains more training inside, and on top of that as a member of WA you’re not required to buy any additional tools like you are with AWOL. Wealthy Affiliate provide all of their own tools in-house, and you get access to these even as just a free member. I still stand by what I originally said in that AWOL Academy is a good program & that you will find a lot of value in the training, but since coming across Wealthy Affiliate I just feel that in my opinion AWOL is not quite as good as I had initially thought… At least not for the money anyway. If you are already a fairly advanced marketer & you are purely seeking golden nuggets then yes, there are several dropped throughout Keala’s training inside AWOL that may help you take things to the next level, but if you’re a newbie… I don’t know, I just don’t think it’s an ideal starting point due to the cost. I mean you could spend $10k on the training & then decide that affiliate marketing isn’t even for you… Bit risky in my opinion. But as I say I don’t want to take anything away from AWOL because Keala has put together a really good program, it’s just a shame about the price. I can see why he’s priced it like that though, it’s so that the affiliates promoting AWOL to others can earn large commissions on the members they get to sign up. I myself even earned some money by promoting the AWOL program, but I only ever promote things that I feel give real value to people & in my opinion people will find MUCH more value through Wealthy Affiliate & the low start up cost makes it an accessible program for a lot more people. If you’re promoting things purely for the money you’re getting paid then to be honest you’re doing affiliate marketing wrong. Money should be a secondary factor, you should be promoting things for the value that they actually give to people… That’s my personal approach anyway & I find that it works much better that way. So yeah, hopefully you appreciated my review here & hopefully you can see why I have come to this new conclusion. I have just tried to be as honest as I can about the program because I feel that you deserve to know the facts & the alternatives before you part with such a huge chunk of cash to a program like this one.